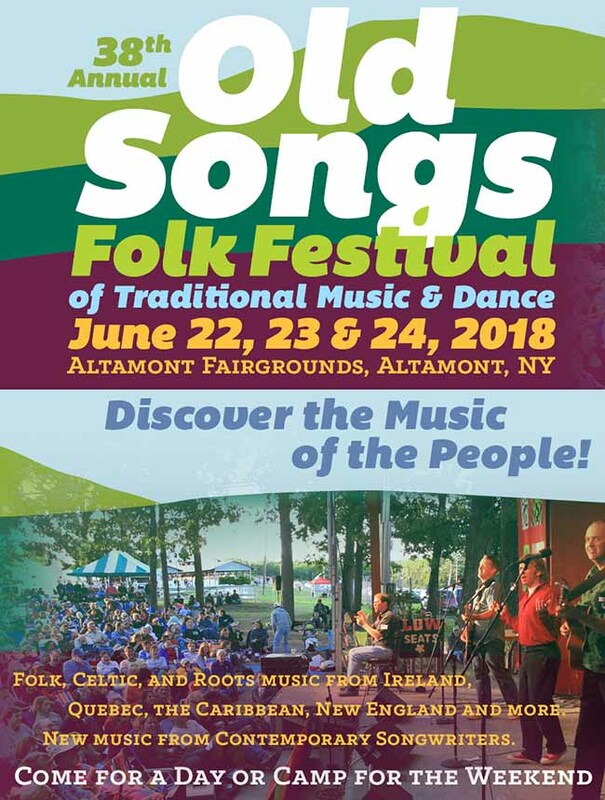 Last weekend Ellen and I made our third trip up to Altamont NY, near Albany, for the annual Old Songs Folk Festival. My long-time friend Tim and his son Gabe were also there, Tim goes every year. We’re on about an every third year schedule. 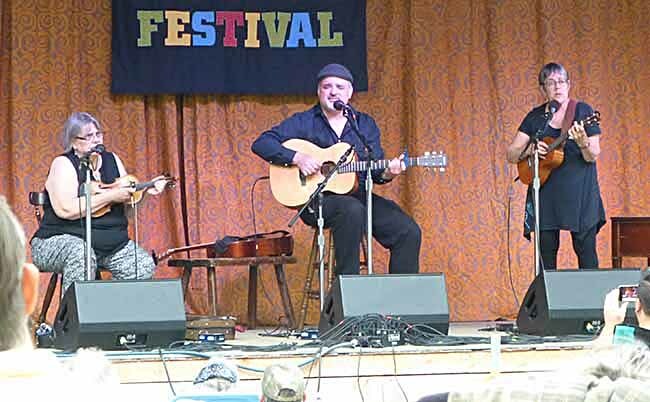 The predominant music style is folk, closely followed by blues and celtic music, with a smattering of other styles and genres. About two dozen headline acts are there, and we always enjoy them. During the day (starting at 3 PM Friday) there are seven venues of varying sizes holding all kinds of workshops, performances and jams. On Friday and Saturday evenings and Sunday afternoon there is a multi-act concert on the main stage lasting about three hours. Tim and Gabe camped there, we stayed in a motel about 10 miles away that turned out to be hard to find late at night when we were tired, but we got there eventually. This year I only have photos of the performers, I never got around to taking any of the rest of the event or ourselves. I did also take video of performances, and I will link to a sampler of that at the end of the article. The first act up on Friday evening was 3 Ravens: Max Cohen, Lui Collins and Donna Hébert. 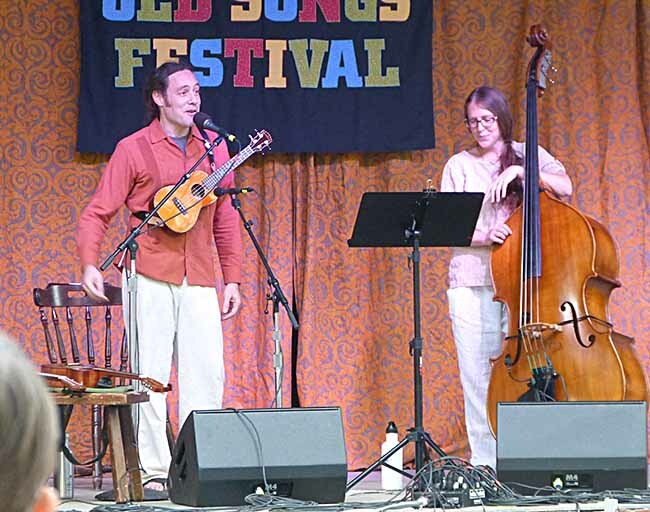 A few years ago they teamed with fantasy writer Jane Yolen on a concert project. Unfortunately I didn’t get any video of them, but they were good, all fine instrumentalists and singers. Next was Stu Fuchs and his wife (didn’t get her name, and it’s not in the program). He played ukulele and guitar brilliantly, she accompanied on stand-up bass. Stu is a teacher in his day job, which came across a bit too much at times, but he does know a lot about music. 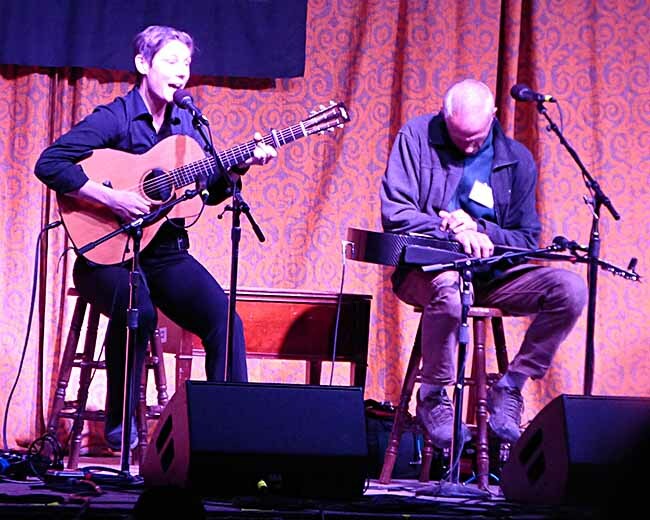 Chris Newman and Máire Chathasaigh played both traditional and contemporary Irish and other music on guitar and harp. Both were amazing players. Máire’s harp was quite interesting, it has a device above each string to make it a half step higher, adding sharps and flats, which a regular harp does not. Getting those switches flipped at the right time and continuing to play is the challenge. 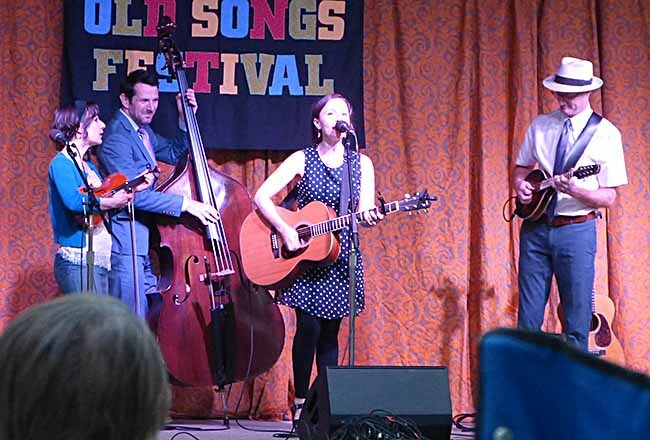 Low Lily is a band with strong folk roots that plays mainly their own songs, and my favorite new find of the event. I bought their latest CD, “10,000 Days Like These,” and I recommend it. 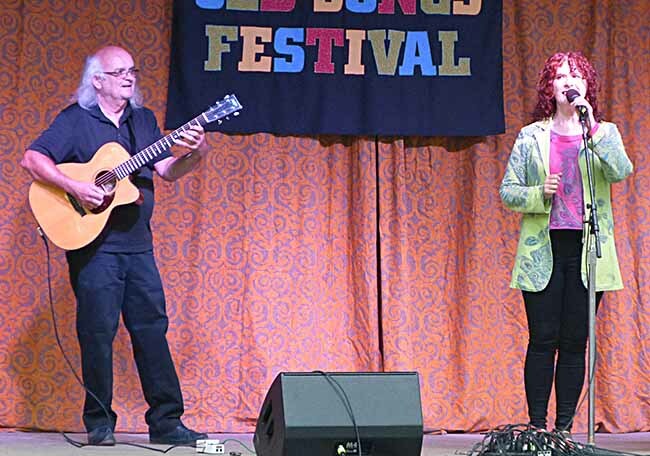 Choc’late and the Gaslight Tinkers are a band combining the music of Jamaica with folk and blues and a bit of swing. They were full of energy and lots of fun to watch and listen to. Unfortunately my video clip does not include Choc’late’s singing, which I liked. 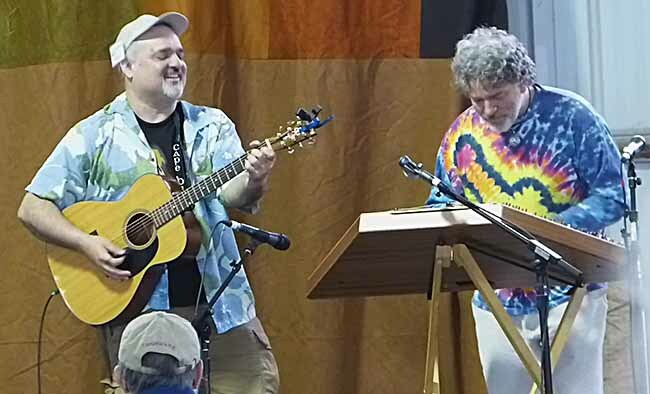 Joel Mabus played Ukelele and Guitar, and his gravelly voice and humorous delivery worked well on both traditional blues tunes and his own songs like the crowd favorite, “Ukelele Schmookelele.” I failed to catch that on video, but it’s hilarious. Alderson, Foley and Murray played traditional Irish jigs and reels expertly, but we all felt each number went on too long. I think it’s a type of music that’s more fun to play than to listen to, at least for me. But, one nice thing about this event is, it’s full of variety. Friday had been rain free, but windy as a front began moving through. Saturday it rained off and on. Ellen and I managed to be inside for the heavy stuff, though Tim got soaked. At least the rain ended before the evening concert, where the audience sits outside, but it turned that area into a sea of mud, which was not fun. Otherwise, the atmosphere was positive, everyone seemed happy. The audience covers a wide range from little kids (who have their own workshops) to doddering oldsters that we’ll be soon, no doubt. Many families and couples, lots of friends greeting friends. The food is varied and quite good. We sampled Greek, Jamaican and Thai, for instance. There are vendors from instrument sellers to clothing and jewelry, and an area run by the festival that sells used instruments as a fundraiser, as well as an instrument raffle. CDs by performers are for sale. 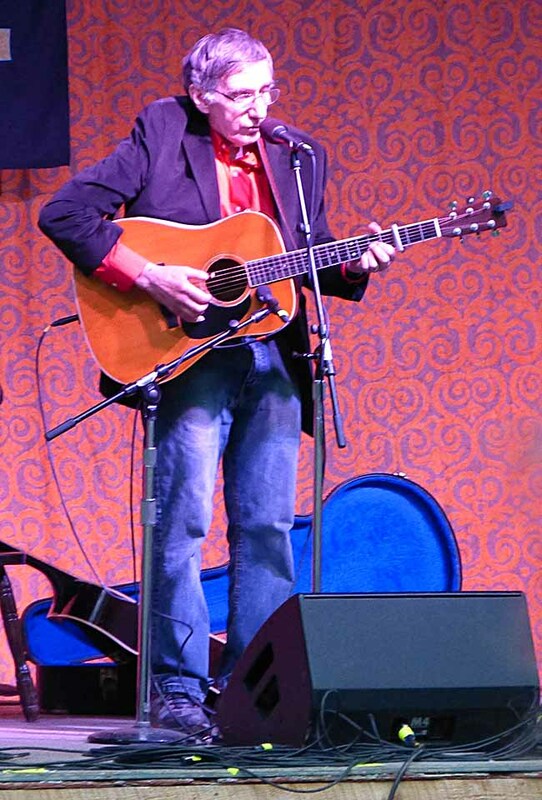 The four of us each followed our own program schedule during the day, but all four of us were at the Jim Kweskin solo performance on Saturday morning in the Dutch Barn, an intimate setting where Ellen and I were about ten feet from him. 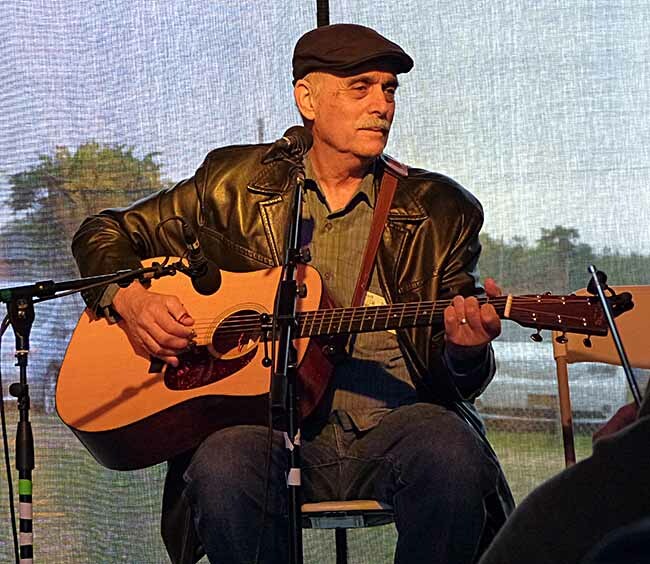 Kweskin and his Jug Band were a favorite group of mine in the 1960s, and he was a joy to see and sing with, as he performed songs from then, and other fun songs. He sounds exactly the same today at age 78 as he did then in his twenties. While we listened, torrential rain outside made background music on the roof. Ellen and I also attended “True Stories Set to Music” with Christine Lavin, Bob Franke and Anne Hills. Lavin was very funny at all the performances we saw her do, and Anne Hill’s voice and music were appealing too. In the afternoon, Ellen and I attended “The Ways Women Find Strength,” enjoying Choc’late, Ellis, Anne Hills and Christine Lavin. again. Lavin’s song about leaving instructions for your own funeral was quite funny. The “Strung Out” program featured mostly guitar players, though Max Cohen did a number with a hammer-dulcimer player, whose name I did not get. I love that sound. 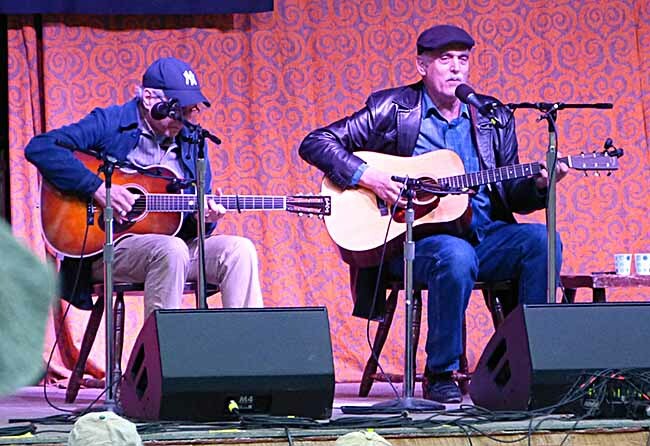 We also went to an acoustic blues program with Joel Mabus, Jerron Paxton, Happy Traum and Jim Kweskin. Somehow the more casual daytime performances, where everyone seemed relaxed, added to our enjoyment. The wooden benches were hard, though. Hope I remember to bring a cushion next time. At least at the evening performances we had our own folding chairs. 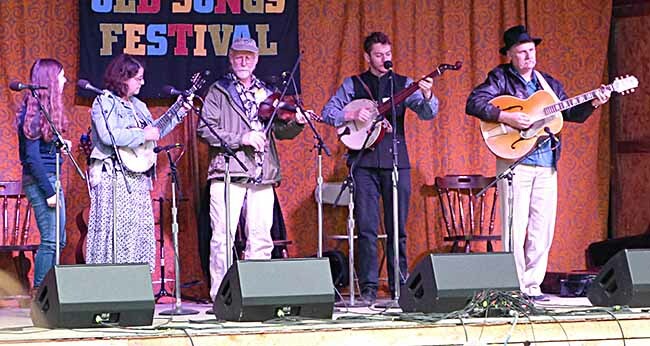 The Saturday evening concert began with Elizabeth Laprelle and the Family Band, an old-time Appalachian music group from Virginia. They sounded like something you might have heard a hundred years ago in those remote hills. 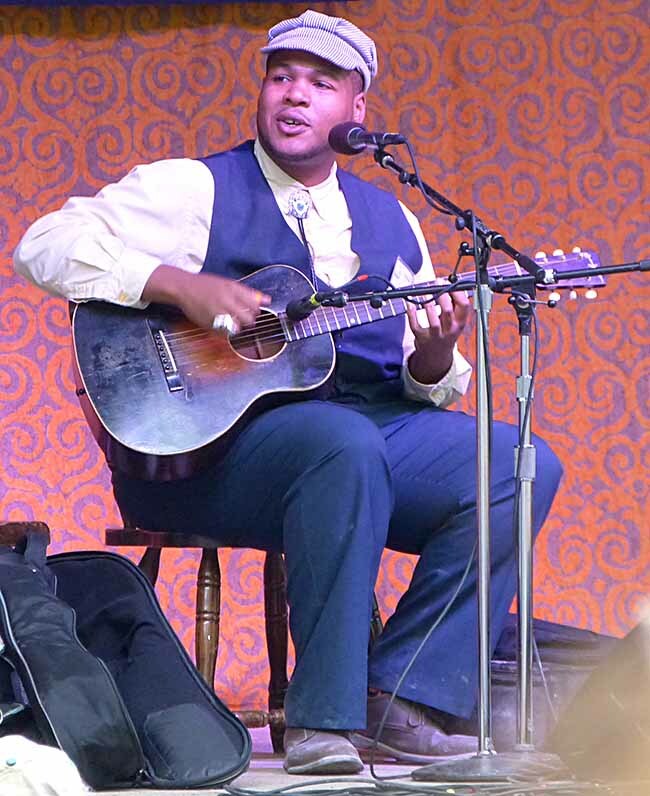 Jerron “Blind Boy” Paxton did some fine blues singing and playing on banjo and guitar. Despite the nickname, he did not seem to have vision problems to us, so it’s probably meant to be ironic, and a reference to some of the old folk and blues performers who were actually blind. 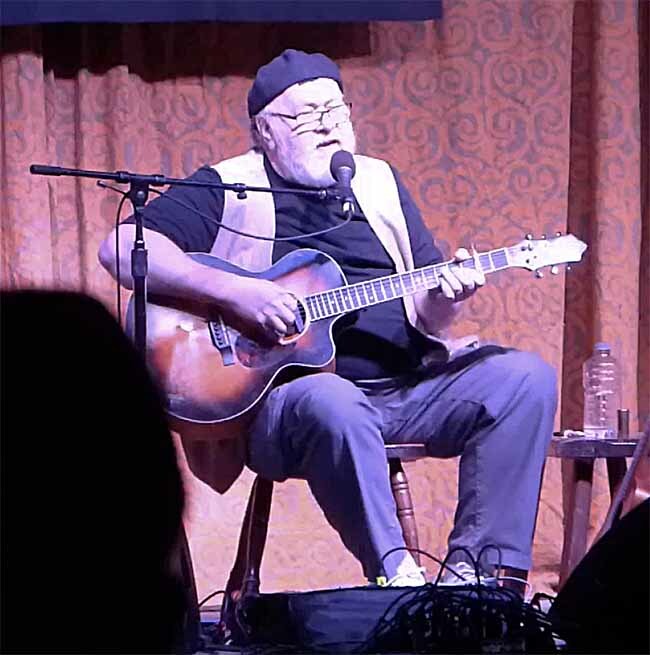 Bob Franke played and sang some original songs, some from decades ago. I didn’t care for his work as much as most of the others. Happy Traum and Jim Kweskin, on the other hand, were terrific. Happy performed for decades with his brother Artie, who died in 2008. Now he and Kweskin perform together at some events like this. They did traditional blues songs and a few jug band tunes as well. 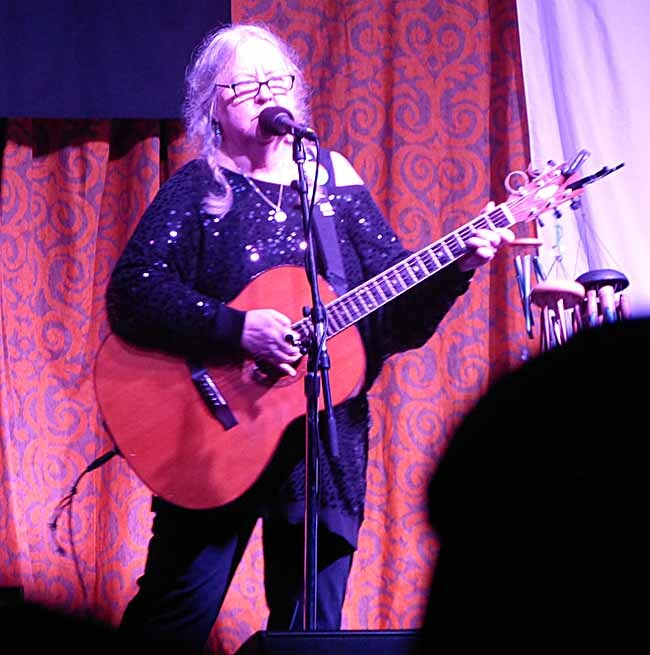 Ellis is a singer/songwriter whose enthusiasm is infectious, but whose songs are often sad. She performed with Peter Mayer (though each took turns), another singer/songwriter whose work I liked and would like to hear more of. Christine Lavin finished out the Saturday program, and just after I got this photo, my camera battery ran out, so I was not able to get her on video. The audience loved her “Password” song, and other funny, biographical work, some of which you can find on YouTube. Sunday morning was damp, but not too bad. We attended more fine programs, but I did not capture any of them. The extra camera battery I’d brought turned out to be dead as well. I particularly enjoyed Traum and Kweskin’s workshop on three-finger guitar picking, and a guitar chord workshop by Chris Newman. After lunch, we headed home, and it’s a long drive about six hours. I’m not sure when we might go back, but we sure enjoyed this year’s festival. Below is a link to a video sampler I put together that I hope will give you an idea of the many fine performances we saw. This entry was posted in Con Reports on June 30, 2018 by Todd.